I’m so glad I just received a sample of this and didn’t waste the $16. I have a pretty high tolerance for plumping glosses, but this one stung like no other. So much that it almost made me dizzy! I didn’t notice any plumping qualities after all that pain and really wasn’t impressed with the glossy shine, or lack there-of, either. SKIP IT! This is a beautiful highlighter that looks super natural on the high points of the cheekbones. The powder is incredibly silky and not chalky at all. This color is not too blue and not too warm – just the perfect “glowing from within” color for day or night. Worth the splurge! A little goes a long way, so I foresee this compact lasting a long time. Borderline terrible. Maybe I got a bad tube? I expected so much more. Perhaps the worst mascara I’ve ever tried. Ahh… the most beautiful color and the most wonderful gloss formulation all rolled into one gorgeous tube of Dior fabulousness. Trust me. I almost like it too much to use it. Almost. I’ve been on the search for an easy red lipstick that I can keep in my purse and effortlessly apply without a mirror. Well, this is it. It glides on like nothing and feels lighter than a lip balm. The color isn’t too orange or too blue. It can be applied lightly for a natural look or layered to make a statement. Plus, the packaging is my absolute favorite. Makes ya feel all fancy. Y’all know I’m a makeup junkie. I’ve picked up these products recently and was able to form my opinions pretty quickly. I post new favorite products pretty often, but never think to post about the items I don’t like. I figure negative reviews are just as valuable as the positive ones. Have you tried anything lately that has just hit it out of the ballpark? Let me know! I’m always searching to try new products. Ahhh yes, I love honest product reviews — especially makeup ones! I can't believe the lip plumper stung that badly! As far as dior glosses are concerned, yes, they are perfect. Dior lip gloss is always amazing. My favorite lip gloss splurge hands down. I've never tried YSL's lipsticks before. Where do you buy it from in Charleston? Since we don't have Sephora I feel like its hard to find designer makeup here. I have been lusting over the Dior gloss!! I just bought MAC's Soft & Gentle and love it for highlighting and as an eyeshadow! I love these product highlight posts because it gives me ideas for new products to try out. I recently tried dior's eye bb cream and it's amazing! It really brightens up the eye area! Thanks for your honest reviews! That Becca highlighter looks dreamy! I've never tried Becca products before but always meant to. 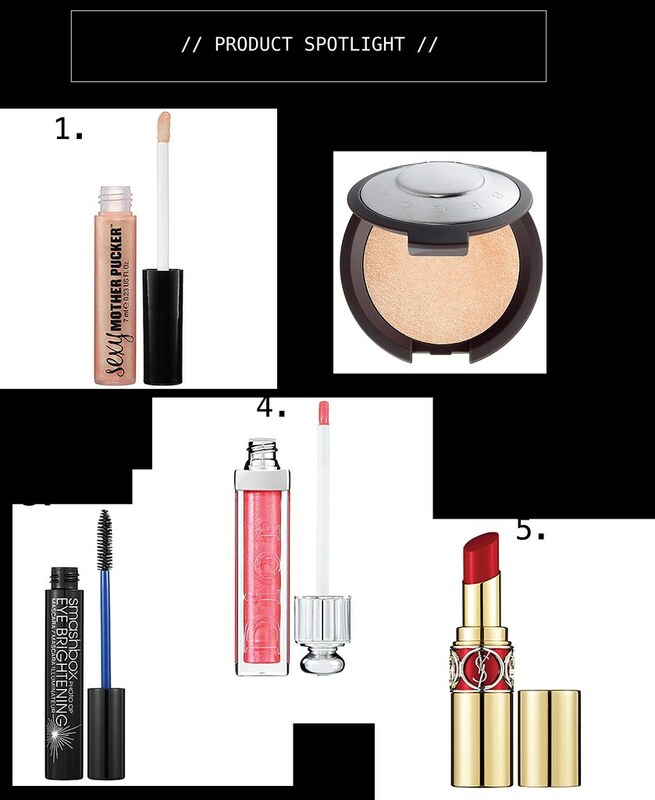 That Dior lip gloss is pretty tempting as well- I'm a big fan of Dior Lip Glow which is a balm stick that amps up your natural lip color. I love it! This is my first comment despite reading your blog for quite a long time now. I just had to say how much I love your blog and the direction it's been going in recently. As a fellow makeup enthusiast, I adore all these beauty posts. Please keep the honest reviews coming – even if they are negative! I'd rather save my money for something that's worth it. personally, i enjoy the negative reviews as well …. just as helpful to know if something doesn't work! I have been eying that YSL lipstick in Rouge in Danger! I just did a post on what reds look best on certain skin tones!! I just picked up a Stila shadow palette, and it is amazing. I have always been partial to MAC and Urban Decay for eye shadow, but I really like Stila. I got the In the Garden palette (There are 2 others) and the colors and quality are great, especially for the price, $39 for 10 shadows.